Sometimes you get an opportunity to do something important. 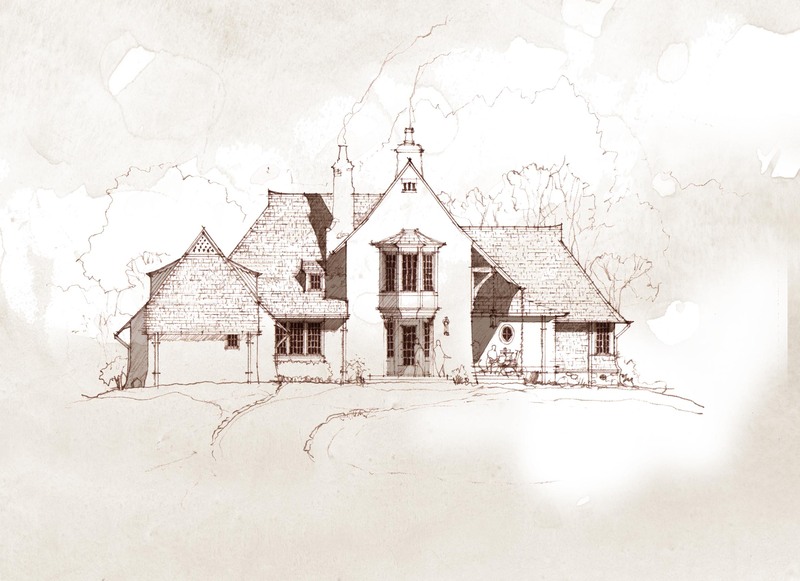 As an Architect, creating a home place is that rare chance to establish a family legacy for a client; a legacy that can potentially be filled with the childhood memories of grandparents and great-grandparents as they reflect on their lives. Many times it is the natural process of the world that has a great influence on the development of such a place. Many times it is the world, family dispositions and some combination of planning, design and good fortune, which combine to formulate an unforgettable place. This kind place can be said to contain a "genus loci" - spirit of a place. This genus loci is a goodness that cannot be taken away or disavowed. It is a breathing thing that can reach deeply into the heart forever. It's the aroma of your great aunt's rose garden, a particular arrangement of live oaks or similar sensory trigger that takes you instantly back to a special time or memory. That's the Raison d'être for many Architects and the hope of every new project. There are also times when great opportunities can be risky such as when taking on a project for family! The risks include disappointment, disagreement or conflict and even emotional separation. 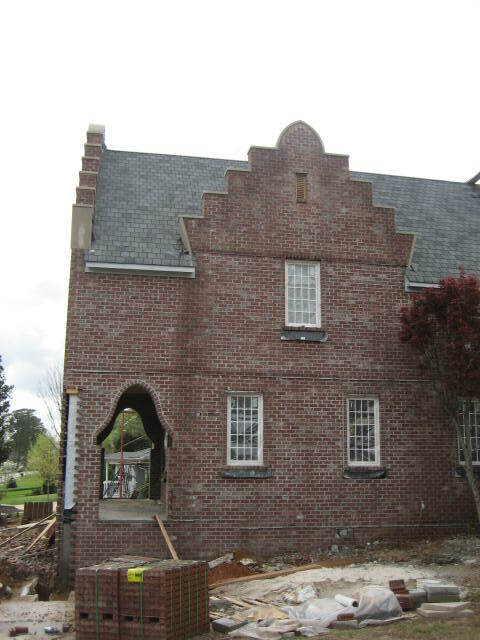 The custom residence on Hamilton Road in Auburn, Alabama is a project for my niece and her family and I thought long and hard about whether to take it on. Fortunately, and not unexpectedly, the project was a huge success and it is my sincere hope that time and circumstance may lend its good fortune into the desire to establish a great spirit in this place. 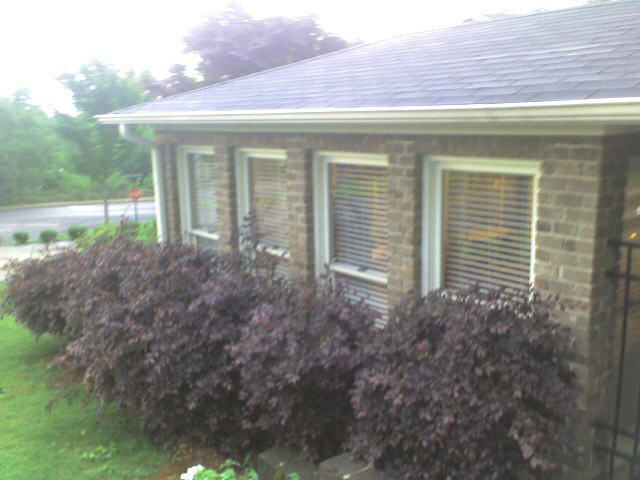 The structure on the right side of the North elevation is a covered parking shed that is framed on the ends by a brick wall. 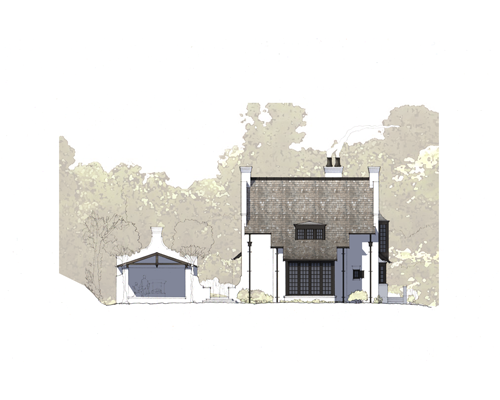 On entering the site, a motor court area establishes the arrival and the parking pavilion links to the house via a workshop and covered walkway. 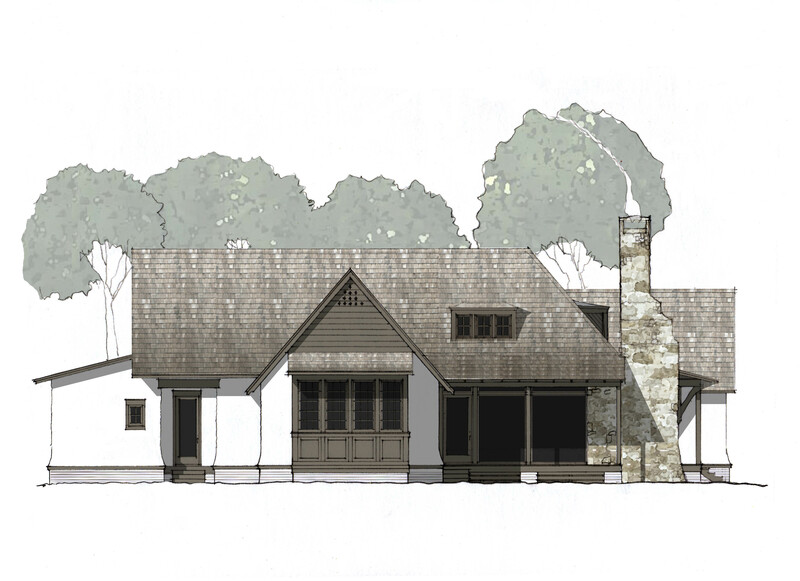 There is a Thunder House structure that establishes a symmetrical balance, teaming with the Workshop building, about a centralized exterior Veranda (all ideas of the client) where this space will make for great family memories over the next several years. That's why we as architects do this - to have a chance to give people the opportunity to make memories. In the worst and the best of times, these memories are like Honeysuckle nectar on spring day. 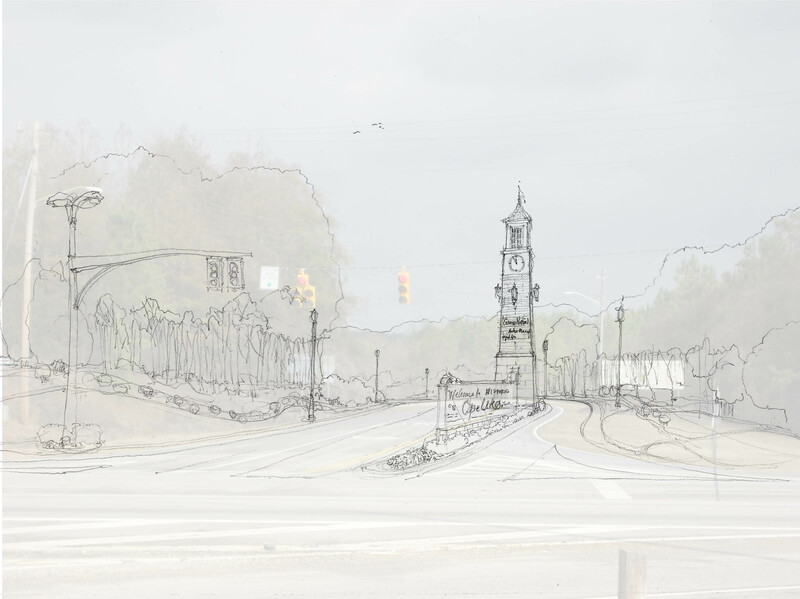 Mountain Brook has so much to offer and it's really exciting to have a project opportunity there. 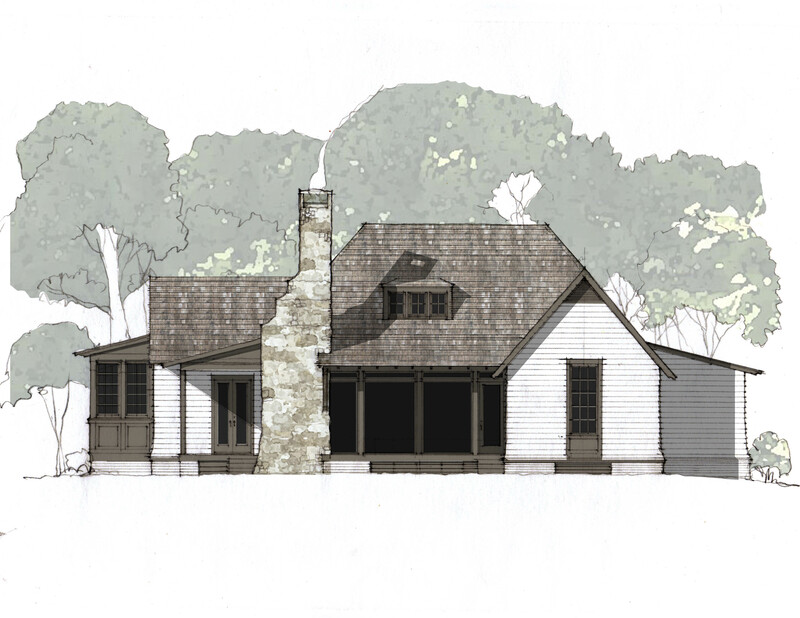 A little while back I began doing some preliminary sketching for a couple who really wanted to do a few things like renovate their kitchen, maybe create an outdoor room on the back of the house and a few other things. This property is absolutely amazing! 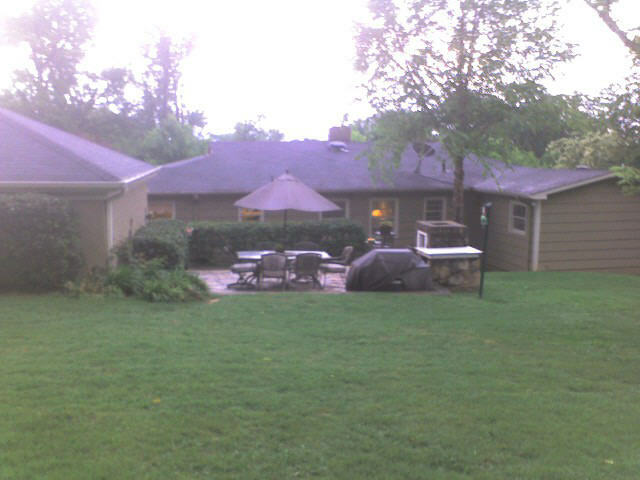 The back of the house has multiple terraced levels of landscaping with both lawn, hardscape & pool and is surrounded by woods. So private and exclusive. As I began the task, it was clear that it would be a fun client to work with and the result could really make a difference to the house as well as the way they would live in it. Of course, the existing house is a larger home and the clients had reservations about making it larger and holding the value of the property. They hoped to not out build the marketplace in the area. As we got further into the design it really became more about creating something special for their lives now. It didn't hurt that across the street a new contemporary home was under construction that would help increase the "comps." 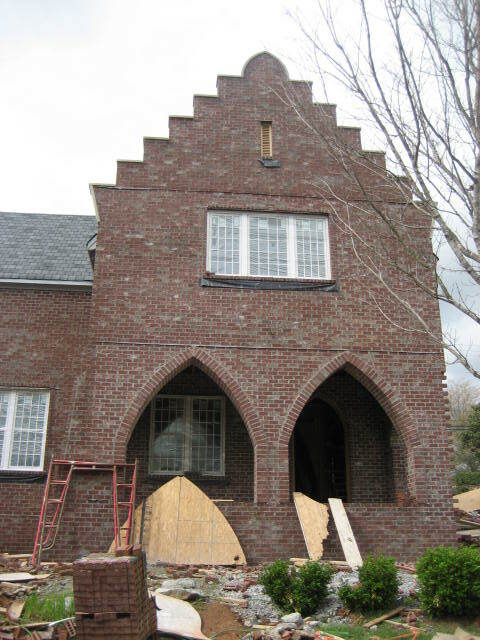 This particular client had had a couple other architects do some initial concepts for them and, for whatever reasons, it just never turned into a construction project. So the task was a challenge in the sense that just the right amount of work, creativity and close listening was necessary to make the project a reality. Ultimately, we found a great balance and the project was built. Carefully adding exterior space, a reasonable amount of utility functions, with an unexpected benefit of interior volume, led to a successful project. 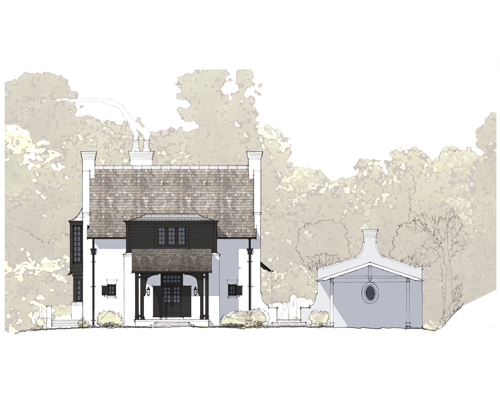 The basic style of the home is Dutch Tudor but the rear has an unusual shed dormer addition on the right side so it was a challenge to develop an overall new addition that blended materials and language. The brick was no longer available so a close alternate was chosen and glazes added to give the right color and sheen adjustments. The Veranda and Office perch above helped to tie the rear new and old pretty well. 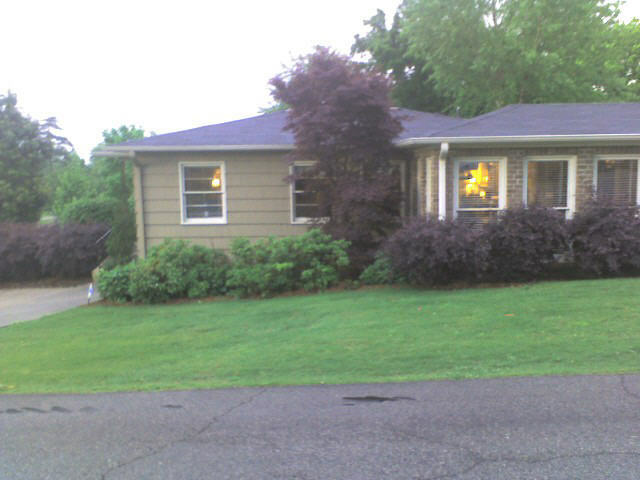 The entire asphalt shingle roof of the home was replaced with wood shingle. Matching the paint colors also added to a good blend. 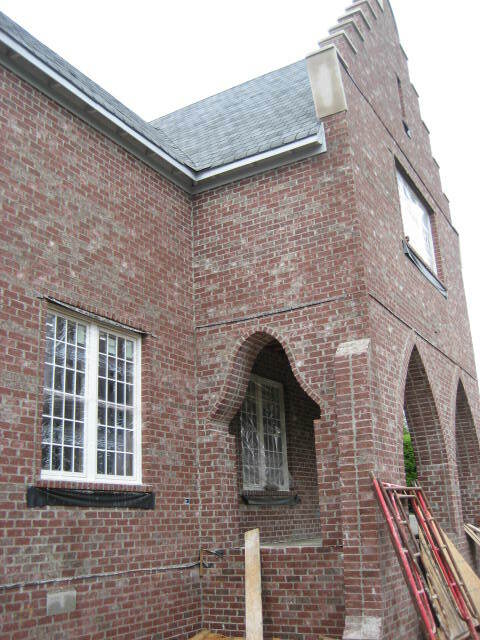 We cut out a portion of the stone surround at the front entrance and removed part of the exterior wall and added a sweeping overhang. The overhang allowed for a timber bracket support detail and the custom wood and glass entry door tied the composition together very well. Hopefully another Mountain Brook installment will follow soon! Peace. I thought I would begin to share a few projects from recent years that I''ve neglected to post. This particular study was done at the request of Opelika Mayor Gary Fuller. 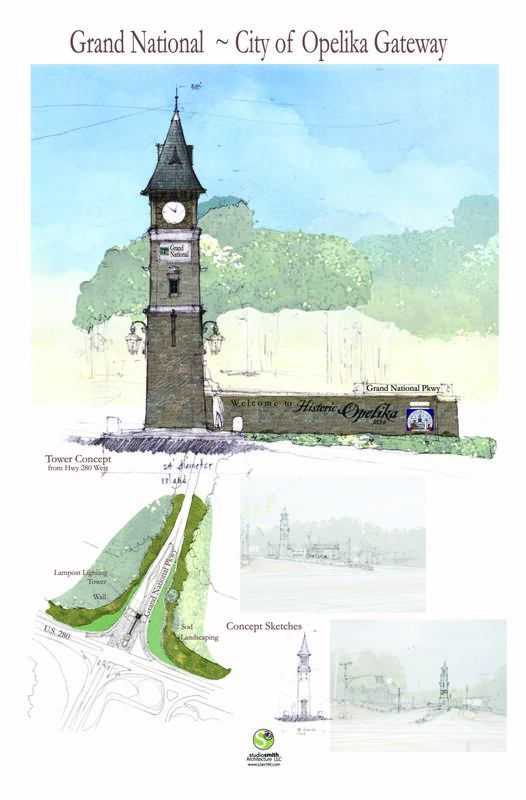 His idea was to create a presence on Highway 280 to announce Grand National, the convention center and home of the Robert Trent Jones golf course. 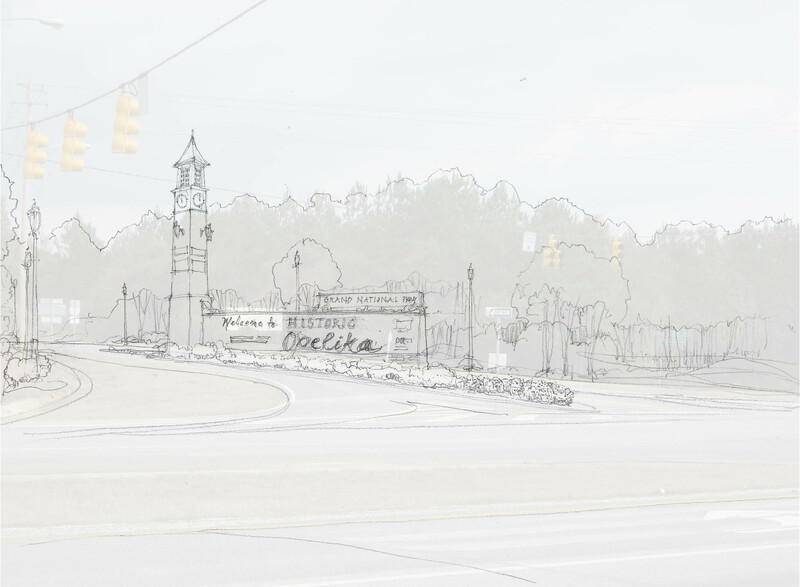 As we sketched through some ideas, the project evolved into a Gateway project for the City of Opelika and involved a tower landmark and included a monumental entrance at the intersection of Grand National Parkway/Shelton Mill Rd. & US 280. Sadly the funding partnership did not come to fruition and the project stalled. There is always hope that an important project like this could revive! Update to "A Delightful Discovery on Shades Crest Rd." The Yancey Residence has been published in Birmingham Magazine! Other publications are also in the works so keep a look out for that in the near future. This project, for me at least, is a great example of what collaboration can produce between architect and contractor when you have a visionary client with great style! A very nice couple from Birmingham purchased a great lot on Lake Martin and have asked us to create a homeplace for them and their two young boys. 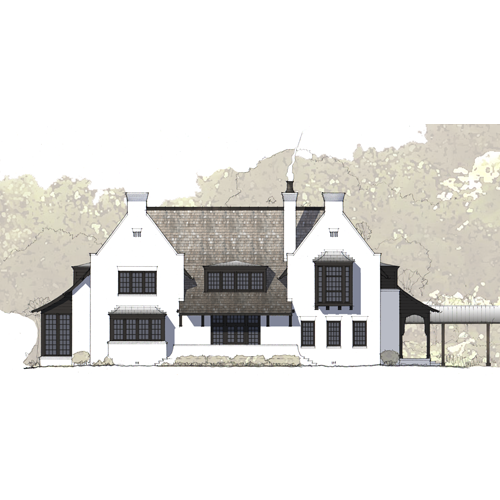 This is not the first project I've designed or been involved with as a designer on this lake but it is the first for studiosmith Architecture LLC. As a part of the Dungan Nequette Architects team, I was involved in the design of a few of the newer homes in the Russell Lands development, Ridge Run. I also designed 3 speculative lake homes in The Ridge for Simpson Davis Construction back in 2007 - just before the market crash. They were never built. I'm very excited about this home because it is just around the corner from where I grew up on the lake and I will get to see it every time I leave the dock for bigger water! The Owner's were looking for something that is very intentional, simple and elegant with great craftsmanship of detail. The property is elongated and narrow overall and has many trees so it was very important to situate the house to capture the morning sun, minimize the brutal west blaze during summers and maximize the views and outdoor spaces in order to really enjoy the lake. We are in the schematic design phase right now so more later. I'm including a few of the exterior design images. Thanks for stopping by! 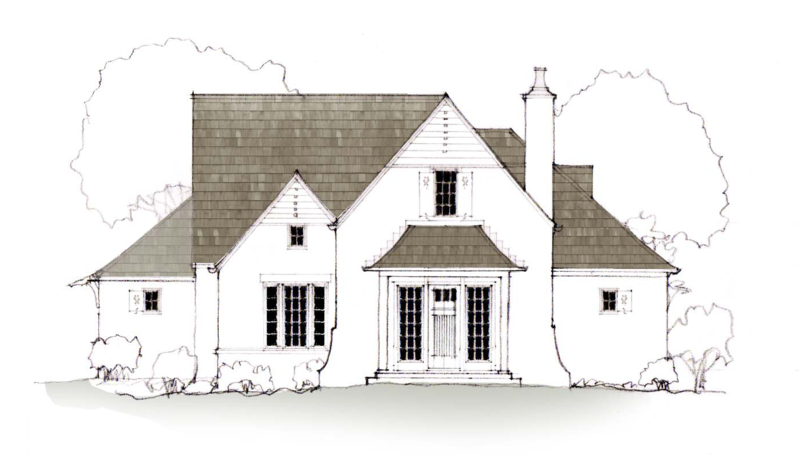 studiosmith Architecture LLC is set to team with Dilworth Development of Auburn, Alabama once again to design the Showcase Home for East Alabama Living Magazine. 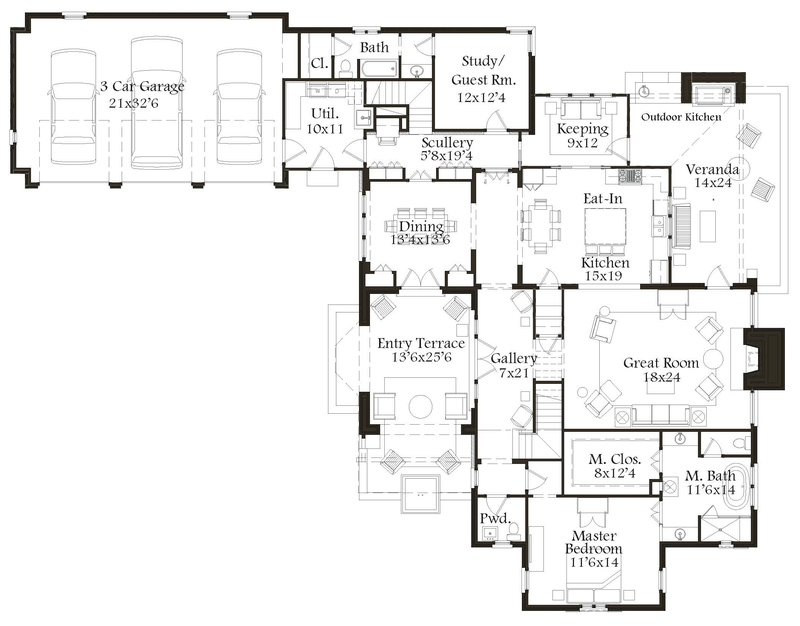 We had great success together in the design of s2Arch's first Showcase Home in 2011 (see previous post). 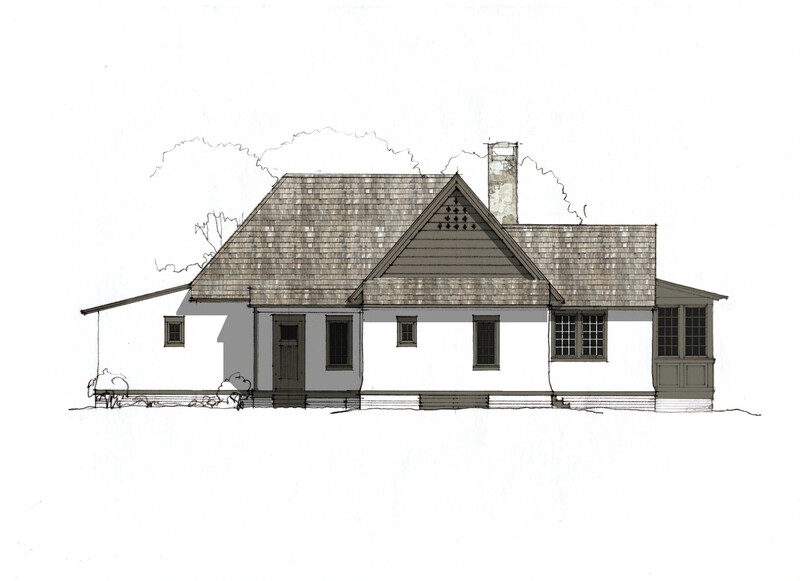 The design and marketing was able to procure a buyer for the house before the design work was completed. These homes are designed and built as speculative projects and the goal is, naturally, to provide an attractive product for a broad range of prospective buyers in the area. The design planning can be difficult because as an architect your goal is to design a great home for a client and in these cases, the developer, realtor and other professionals with skin in the game become the client. 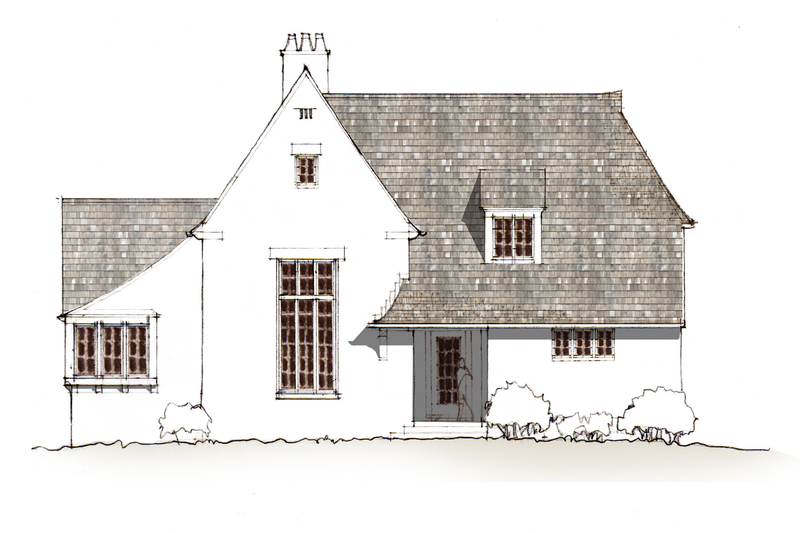 This year's home is set to be built in a new Auburn neighborhood for which we designed a series of homes to establish an architectural character, created a logo for the neighborhood and provided a streescape rendering for marketing. 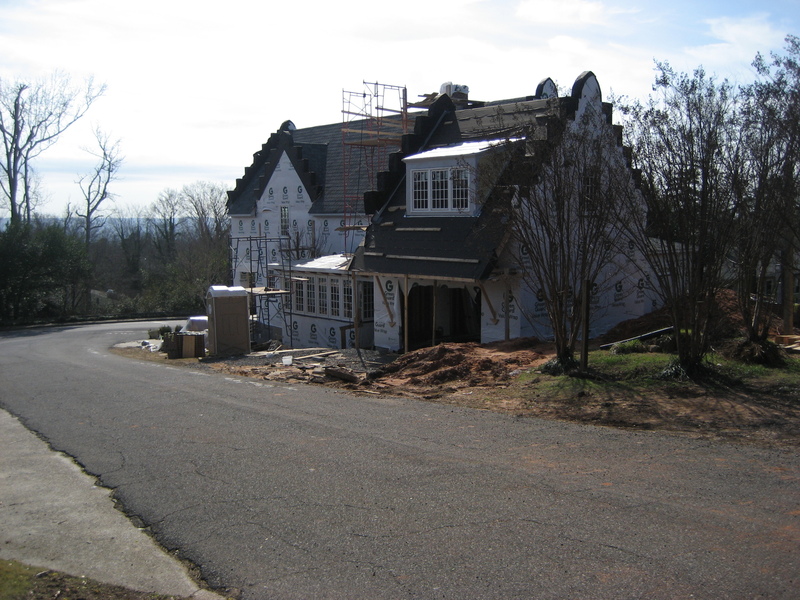 The Yancey Residence construction by Ruff Reams Building Company is progressing well. What started as a fun sketch session is blooming into a source of real joy. Bart & Danielle Yancey have always been the type of client an architect hopes to find. They are open minded , honest, interested in great design and have great taste to boot. The architect is always challenged with listening well and interpreting a client's needs, wants and understanding of the process. It is natural to have to illuminate what the architect does as well as the what it is that is placed in front of them to visualize about their building project. Not everyone understands or visualizes as well as the architect by the very nature of the art and science of design but every once in a while the architect and client find this common ground and can make something unique happen together. As the forms, surfaces, volume and light come together in the construction of this home, I'm delighted to discover that we've found that common ground together. 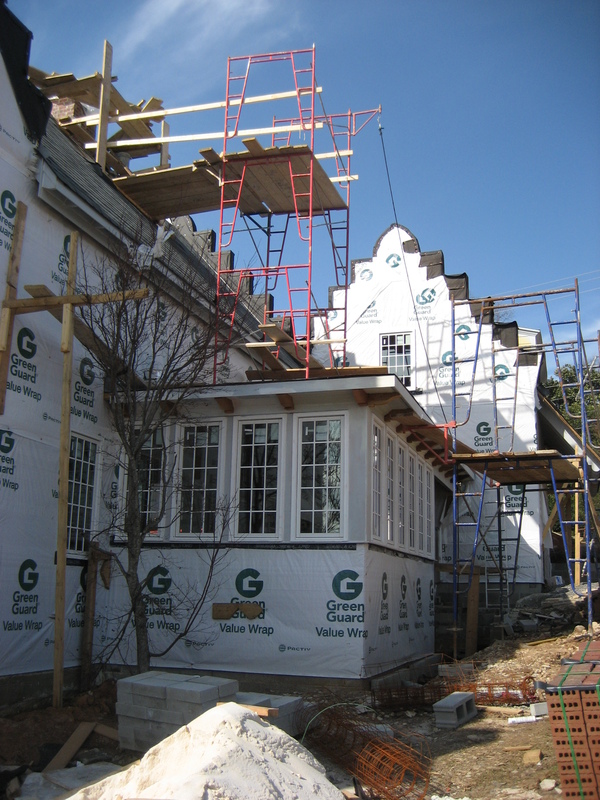 The exterior finishes are nearing completion and the interior spaces are getting full attention. 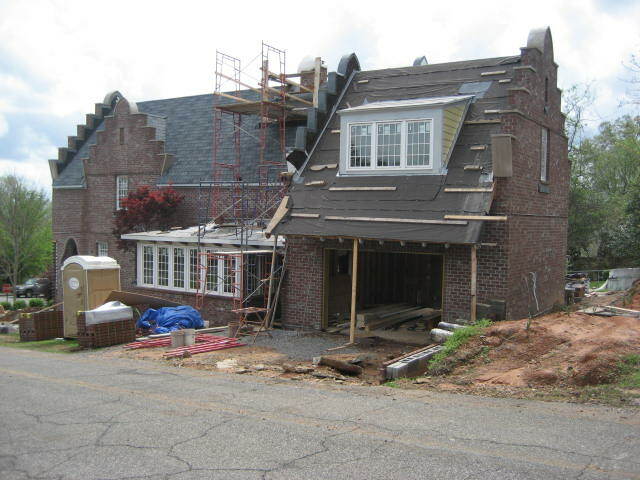 Roofing, stucco over brick, windows and chimney pots are in place as are the wood bracket supports at the Garage overhang and the iron supported copper awning at the front entrance is under fabrication. The "Perch" is visible in final form as you travel along Shades Crest from 31 and it peeps out between the trees. Loving how that has turned out. I'm looking forward to the interior finishes as they begin the completion of this journey. In the next phase I will begin to upload some interior shots as they unfold. 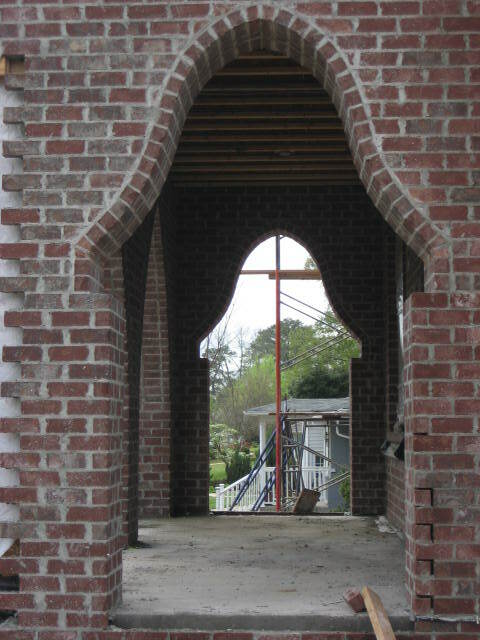 beyond and dramatic yet simple gable forms; to anchor the corner of the lot with the edge of the structure and to allow the house to set the stage in the rear yard as a private court. I loved the idea of a perch upstairs for Danielle's use as a creative studio and the view towards Hwy 31 down Shades Crest was a perfect place for this to happen. The following are some of the before photos made with a phone camera - so quality is poor. I will be following up with more pictures of construction progress in the next post. 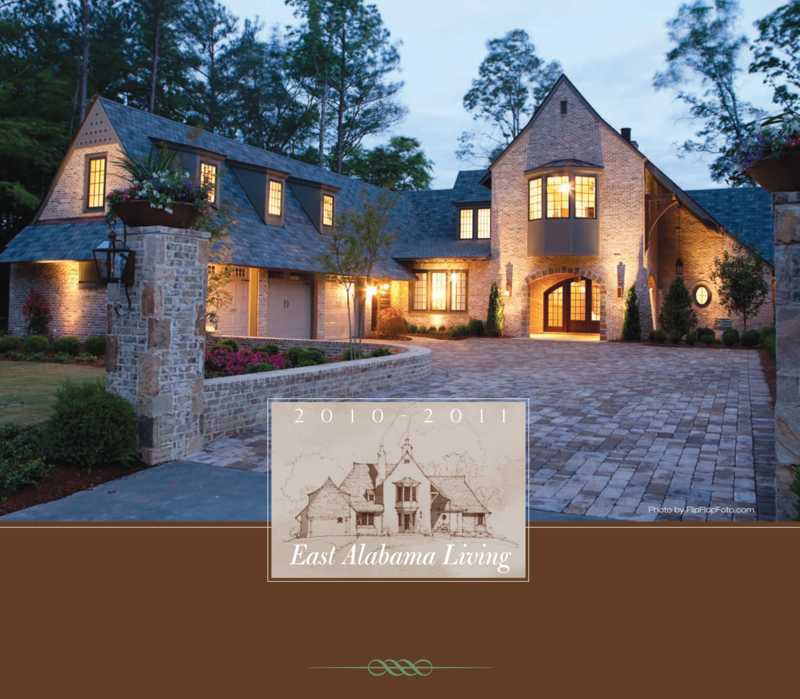 East Alabama Living Magazine annually selects a builder and architect for its Showcase home and for the 2010-2011 year, studiosmith Architecture, LLC and Dilworth Development, Inc were selected as the featured team. The full spread feature included articles and photographs of the design and construction process across its Fall, Winter, Spring and Summer issues. 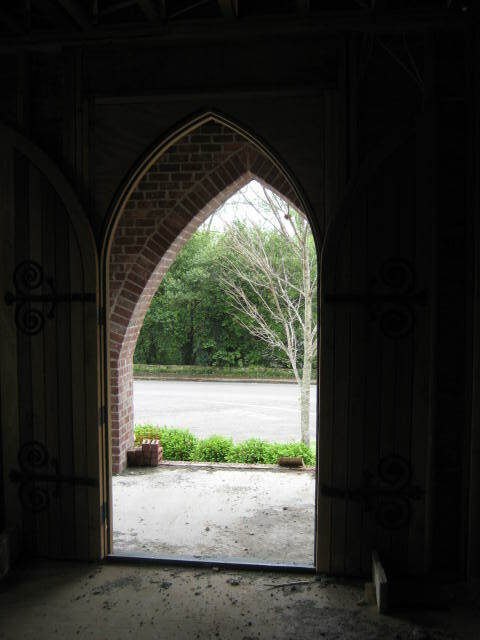 The project is a new community in Auburn, Alabama called Belcastel. 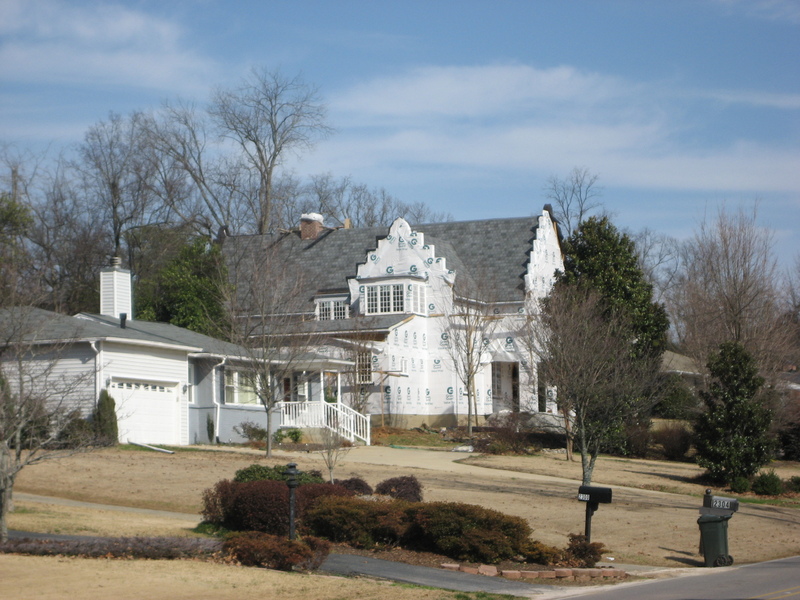 It is actually a single street at the end of Fairway Drive, a prominent and high profile street in the Moores Mill Golf Club community. 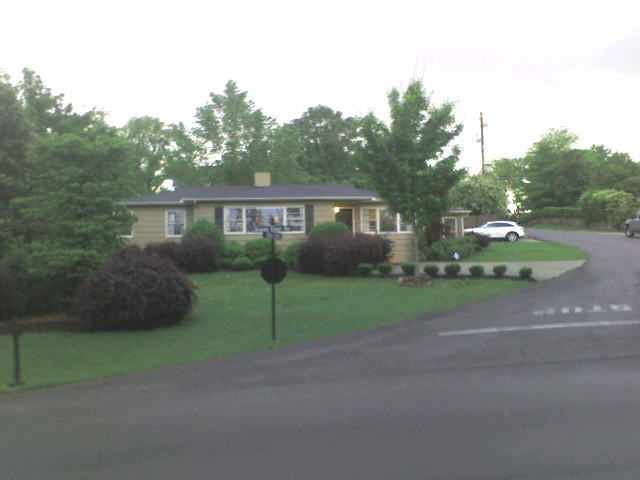 The street is built out on one side only as the homes face a utility easement. Working with the builder/developer, studiosmith Architecture, LLC conceived of the theme, developed the property layout and designed the branding and marketing for the community. 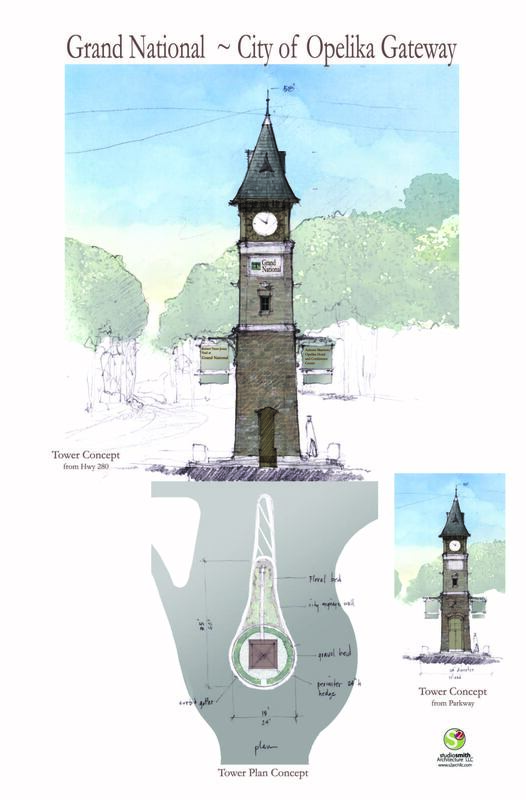 Design elements included the master plan, logo, marketing material and imagery as well as street lighting, entry monument, onsite marketing sign during construction and landscaping ideas. The easement was allowed to maintain its natural foliage and landscape, while the edge of the street was bordered with a paved sidewalk and large stones are sprinkled along the street. This creates a very nice natural feature that is an amenity to the community rather than an a typical easement. The landscape makes for a picturesque view from within each home. 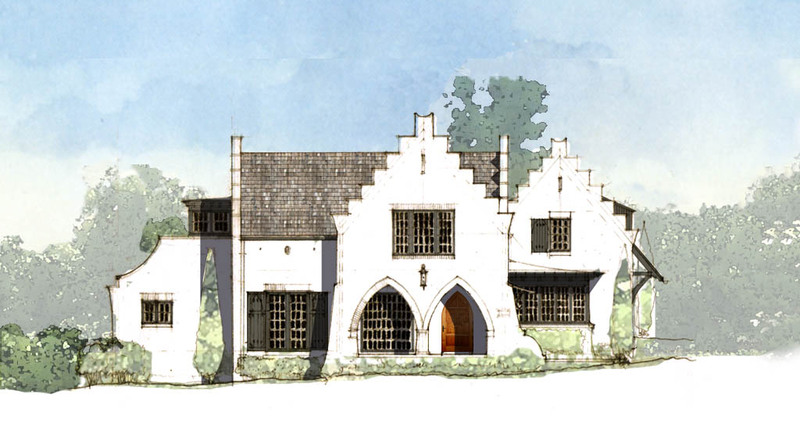 The feature design project was the Showcase Home designed as a custom speculative residence. The idea was to showcase the design process where a team works closely together to marry a custom approach to residential design with the common aspects buyers look for in a home. Architect, builder, interior designer, marketing and realtor each played a significant role in determining how best to provide a high end custom residence, while also paying close attention to the buyer market. Naturally, the design experienced modifications along the way based on the input from the research and experience of each team member and the result was quite good. Although a few truly custom aspects of the design were changed, a buyer came aboard before the conceptual design was complete. In this way, the project was a successful venture. 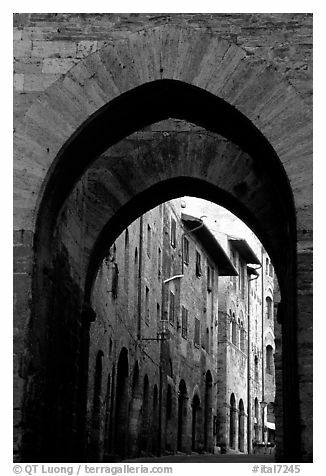 The design concept was to, first, create a structure with a timeless feel and old world charm. 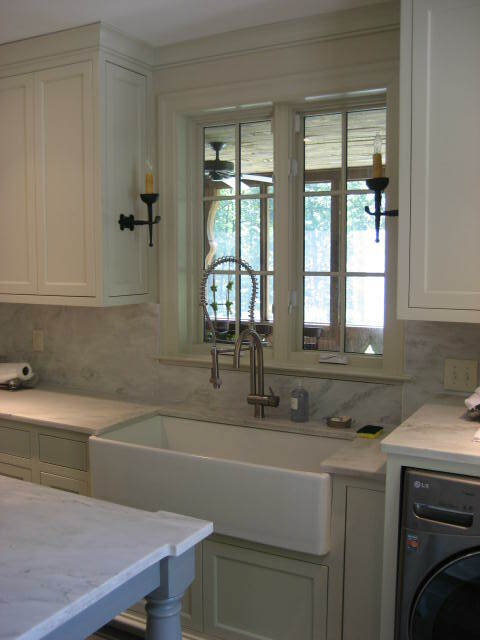 The basic request from the builder was a French inspired theme for the community and this home. 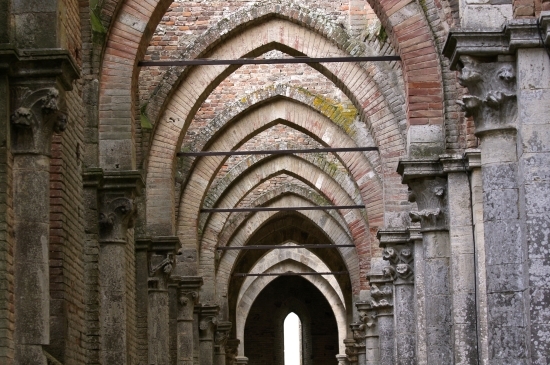 It was very important to establish a sense of place and a home that had mass and presence. 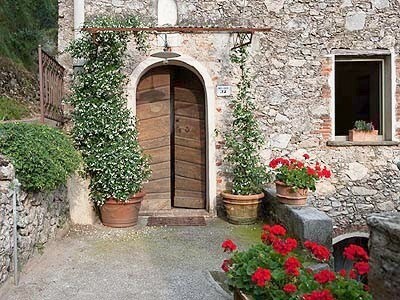 Brick, stone and heavy timber are the primary materials used to give the home a feeling of longevity. 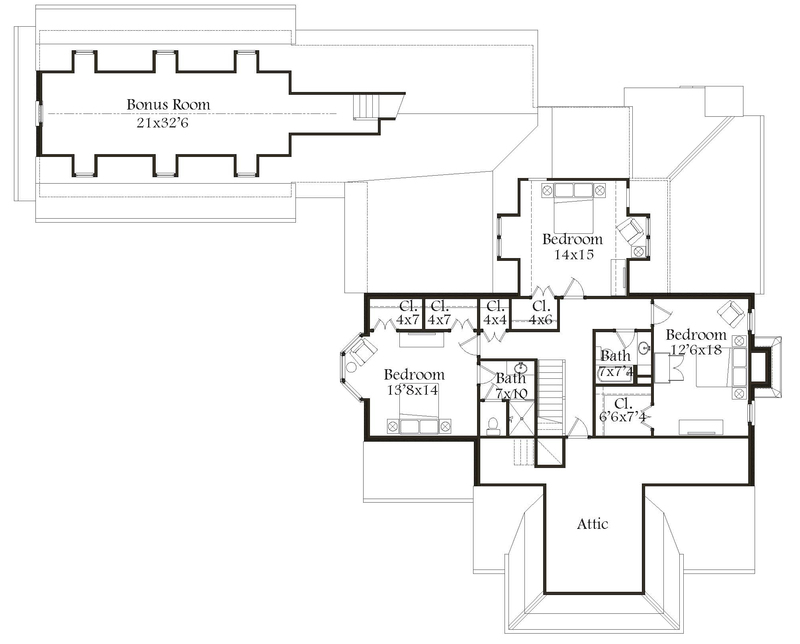 Of primary import to the design were natural light deep into the home, privacy for the master suite, an open kitchen with adjacent keeping room, outdoor living space and entertainment areas. The end result is beautiful and really captures the essence of what the team was looking to achieve, which was an elegant and timeless home that creates a sense of place. See future posts for construction photos. Enjoy!